Taiwan, 2003. 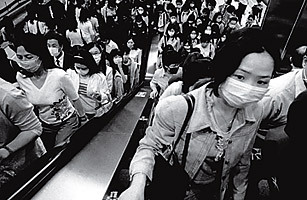 Commuters in Taipei take precautions at the height of the SARS epidemic. On that afternoon in 2003, Hong Kong looked like a scene from a zombie movie  deserted streets, empty storefronts, even a bus seemingly abandoned in an intersection. I was the only shopper on the fourth floor of the Landmark, one of Hong Kong's most fashionable malls. The shop attendants, wearing surgical masks, leaned on the glass-topped counters and stared vacantly at racks of on-sale clothes; an employee at Kenzo told me the shop was averaging two customers a day. And she was counting me as one of them. As the SARS virus exploded in early 2003 out of southern China, infecting thousands of people and killing hundreds, it was hard at first to piece together what was happening. We journalists focused on the biological and epidemiological aspects of the outbreak  the symptoms, the number infected, the path of the epidemic, which we traced on maps with our fingers. Yet as we tried to understand, there always seemed to be an obfuscating layer: something or someone was working against comprehension. There were powerful forces, it would turn out, that from the start were intent on hiding as much about the disease as possible. Those forces permeated the Chinese government, from local functionaries all the way to Beijing. At the time, China's reasons for dissembling about the emerging virus seemed relatively easy to understand: a leadership transition from Communist Party Secretary Jiang Zemin to Hu Jintao was under way, bad news was seen as a threat to economic growth, and it was embarrassing to be seen as the source of a disease epidemic. The mistaken conclusion in the West, however, was that the global outcry over China's SARS cover-up would turn the Middle Kingdom into a more open society. On the contrary. Rather than showing a country in transition, the SARS episode revealed one far more resistant to change than the West understood. In fact, China's response to SARS offered a virtual guidebook to all the elements of its closed nature, marked by its refusal to own up to domestic problems, acknowledge the human rights of its citizens or deal openly with the media. The ruling Communist Party elite acted in a manner that would become increasingly familiar as more and more global attention came to bear on the world's fastest-growing superpower. When this year's Nobel Peace Prize was awarded to imprisoned dissident Liu Xiaobo on Oct. 8, the Chinese government removed his name from all search engines operating in China and placed his family under house arrest. It all seems clearer now, but at the time of the SARS outbreak in Hong Kong, we were struggling to understand a new phenomenon, how a modern city experiences an epidemic. In Hong Kong, we would go through all the stages of a typical outbreak response: denial, fear, panic and, finally, rational response. For those of us who stuck it out  and thousands, including my family, fled  the sight of the abandoned city became familiar, but the experience of it remained novel. For a while, you could get a table at any restaurant at any time you wanted  until the restaurants started shutting down. Hong Kong residents stayed in, hoarded staples, hoped for the best and waited for the worst. We dared not clear our throats in the presence of others for fear we would be accused of harboring the virus, whose first symptom was a dry, hacking cough. I was the editor of TIME Asia, and our initial story asked the most basic question: What is it? At first, we heard vague reports of shops up the Pearl River delta in China running out of vinegar as panicked villagers in the Guangzhou area sought to boil the liquid and breathe its vapor  a home remedy for respiratory ailments  while local mainland newspapers reported that the outbreak was only a rumor.